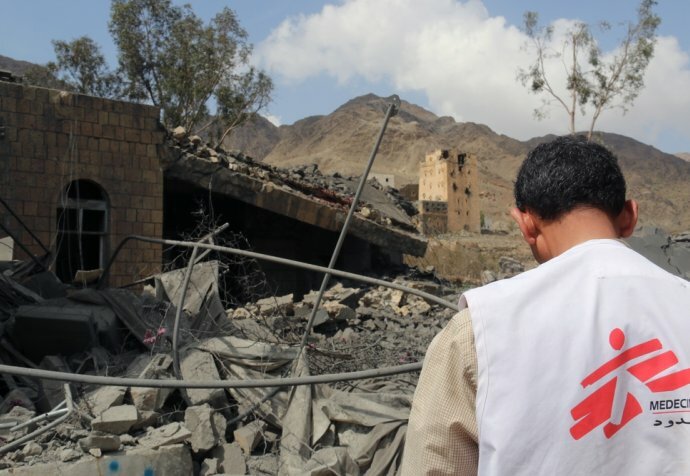 Suzel is a Médecins Sans Frontières Australian nurse currently working in Ibb, Yemen. This latest blog is part of series that Suzel has shared. After the suspension of the peace talks in Kuwait unfortunately the airstrikes in Yemen started again. On Monday night we could hear the planes going to Taiz, where there were more than a dozen airstrikes that night. Ibb was also bombed that night and the next morning. We received the injured people in Emergency Room and it was incredibly busy during the night, with 60 presentations. This continued into the morning. "On Monday night we could hear the planes going to Taiz, where there were more than a dozen airstrikes that night. Ibb was also bombed that night and the next morning"
The injuries from the airstrike in Ibb were very different from the gunshot wounds that we usually see because it was a petrol station that was hit. We had a combination of burns and shrapnel injuries. It was quite horrific, especially when we see a 13-year-old kid end up in our resuscitation room.That morning we received word that some people were still trapped under the roof of the petrol station. So the team got ready to receive them but no one came. I still don’t know if it was wrong information or if they went to another hospital, or if sadly they had died. For the moment I am the Acting Medical Team Leader. This means there is a lot of work as it’s all new for me. But it is also very exciting and I do enjoy this new position. Our Medical Coordinator came from Sana’a for few days and she was a great help. And our national team have been very supportive too and help me as much as they can. While the work is still very challenging, there is a good atmosphere in the hospital with the team, even if the ER remains chaotic at times! The staff are very motivated and participate in all the daily activities of the department. The attendance to the training sessions is getting better and better. The weather has been cool with a lot of rain and the mountains around Ibb are very green and very beautiful. The staff have been showing me photos of the waterfalls that are really big at the moment. It looks incredible. I would like so much to be able to go there for a walk and a bit of fresh air but given the current situation it is unlikely that it will happen anytime soon!